There is a little bakery on the island of Maui that L. and I stopped into once on our way to Haleakala. It is a shack so small you would hardly notice it but for the light in the window on a misty early morning. It was dawn, almost night still when we discovered this tiny bakery and ran in to grab coffee and muffins. I remember the sun was just starting to come up as we sat on a little bench under the palm trees. The morning was balmy and the plumeria blossom scent was heavy in the air as we took the first sips of the best coffee we had ever tasted, Kona, mine with coconut flavored creamer. I reached into the little brown paper sack and handed L. a muffin. I took the other and we both just closed our eyes and moaned. I felt like my heart exploding with joy. I looked over at L. and he said "My God, what is IN this?" as he stared at the golden, soft, plump muffin in his hand. "Macadamia coconut but you're right. This is crazy good. Like we could easily become addicted to this." "We need to move here," L. said as he took another bite of this Hawaiian heaven. We never did get back to that bakery during the blissful week of scuba diving and whale watching and getting back to what is important- quality alone time between a husband and a wife. It was bliss. We debated moving to Maui but wondered if perhaps everyone felt like that when surrounded by a soothing surf and gardenias the size of dessert plates. 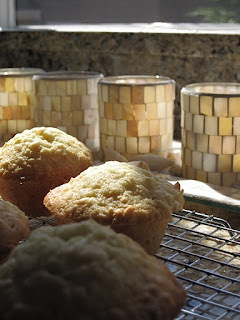 Since we've come home from Hawaii, I have been trying to recreate these muffins. Something was always missing. Last week I was in Target and I wandered down the baking goods aisle. There was a box of coconut quick bread mix. While I am a big proponent of things made from scratch, sometimes you can add something to the box and it works. On Sunday morning I prepared the mix as directed but added in 1/2 c. shredded coconut and 1/2 c. freshly chopped macadamia nuts. Instead of muffin cups I sprayed the cups with Bak-Klene ZT (from Williams-Sonoma) and used an ice cream scoop to add the perfect amount to each cup. I baked the muffins according to the package directions. It was early, about 6am, sunny and breezy a rare day in Seattle but it was unmistakable. My nose twitched like our puppy sensing a squirrel 100 feet away. The smell was just like that of the bakery in Maui. I wandered into the kitchen, turning on the oven light, inhaling the sweet heat from the muffins. The anticipation was so good and when I did open that oven door, I felt every sensation L. and I experienced sitting on that wooden bench in front of the bakery. The smell wafted upstairs and brought my husband into the kitchen. He was like a sleepwalker drifting towards the cooling muffins. "No! Not yet!" I said. I prepared a sunny Sunday morning breakfast of omelets with goat cheese and French herbs and served them with espresso and the muffins. We were listening to "Mele O Hwaii." It was perfect. L. closed his eyes as he took his first bite of the muffin "Oh, yeah. This is it. This. Is. It." As I type this there is one muffin left on the cakestand. Just looking at it makes me happy. 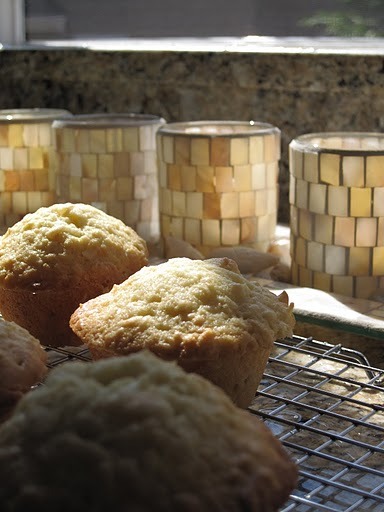 If you have been to Hawaii and you want to experience a little piece of that heaven, make these muffins. I promise you will be happy. That's not a promise I make lightly. And if you REALLY want to smell like Hawaii, try Island Song. It is a perfume I wear that I bought it Hawaii that literally smells like Hawaiian air was caught in your hair. It's mango, coconut, plumeria but not cloying. You just smell like flowers. I first bought it in the gift shop of our hotel and when I ran out I was amazed you can find it on Amazon.com. This has become my signature scent. Yes, it is happy in a bottle.